This is close to Niagara Falls as noted in description. This was very nice for us as we went into the park on several different days. This park is located in more of an industrial part of town. It is also very close to a lot of shopping. There is no cable in the park and Wi-Fi is pretty much nonexistent. When I asked about the Wi-Fi I was told that it would knock you off after 10 minutes and you would have to log back in. I never did get it to work. Park was close to the falls, and clean, but the spaceing between campers was way too close! My bedroom slide was almost over the next campers picknick table, my table was 2' from the the sewer connection of the other camper. In all this did not appear as a 9 10 9 rated park. Pricey, but the place is nice enough. We ended up with one of the wider spots that also had a little shade. Restrooms were clean. The facilities in general were well maintained. The front desk staff was friendly. If you have young children there is a nice little playground. The pool is also a plus. We spent two nights here in late June and was very happy with our site. The bathrooms were new and super clean. The pool looked new as well, but the temperatures were very cool while we were here so we did not use. We did not have any issues for the staff to address but check-in was quick and painless. The onsite travel assistance/agency was very helpful in getting us maps and recommendations. Would stay here again. Campground had full hookups, but was not much more than a parking lot with very narrow parking spots with large gravel rocks. No Cable and very week wifi. The owners are not friendly - They should seek to own a different business. Witnessed tent campers who were just a little late for check out being harassed. Campground was less than 20% full. Very close to the falls, but not our preferred type of camping. To open and no enough trees, sites are only 6 feet apart. Felt very claustrophobic. You have to read the reviews. The campground was just what we needed. An easy place to park with full hookup. We did not plan on spending any time at our camp site - all of our time was going to be spent seeing the Falls. It suited our purpose. I guess its all what you are looking for. This was adequate. I will say that if you read reviews, the available tour office was perfect. Take the tour - nice that it was right there. Nasty woman who runs the campground. Very noisy because of being so close to highway and also bus depot. We have camped all over the country and this is the first review I have written. Felt compelled since we were treated so poorly here. 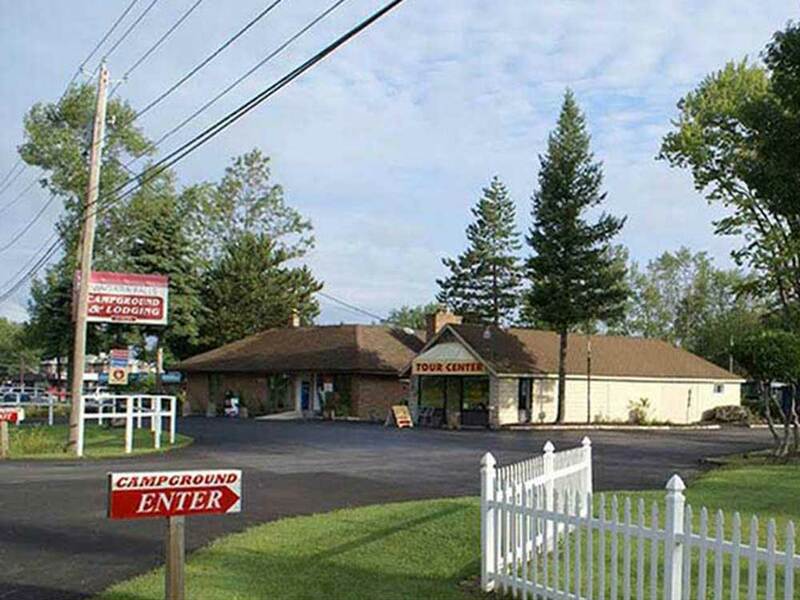 Close to Niagara Falls if you are visiting, but go someplace else to enjoy a camping experience. WAY over priced. Lawns/weed patches not recently mowed, gravel sites that are very tight. Busy HWY 62 is noisy. We would not stay here again. Campground in general was very well cared for - restrooms and showers were clean and well cared for. The owners however need to find a new line of work. We came in at 11:00 am check in was 1:00 - rate to check in early was 1/2 day even though site was empty. Wife of owner says "you go way, come back later" Adjoining site under construction had wood laying around, we bought 3 bundles of wood from camp store at $8 and picked up some additional wood from construction site. They tacked on $ 50 charge for wood and damage to grass burnt grass about 8 " outside fire ring. . I have been doing the RV thing for 8 years - this is my first complaint. Great facility - really lousy owners. For the rate I paid, you need to not nit pick!!! !